Can you find out what is difference between Tata Indica and Tata Aria in the above photo ? Almost same designs. 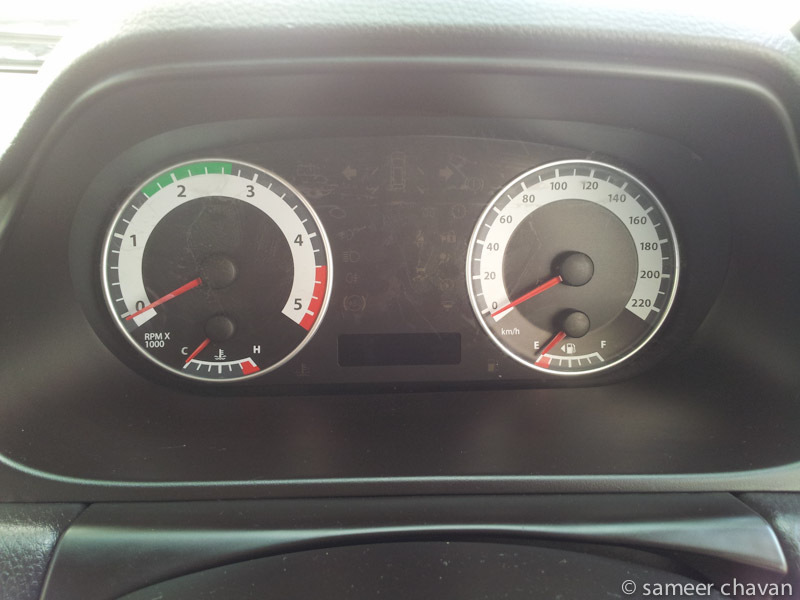 I brought TATA Aria in March 2012 from KHT motors, ITPL Road, Bangalore. 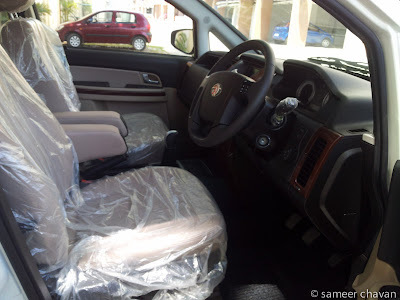 I did review the XUV500, Innova & Skoda Yati. My first preference and liking was off course XUV500. Didn't like Innova as it has become old outdated model and Scoda yati was expensive for small size capacity. The Yati interior capacity looked smaller than my Ford Fiesta. Well, Aria is my 4th car. My first car was Tata India, then Ford fiesta and also had Opel Corsa. I liked it like all other Indians at the first slight. I would have brought it, but it had like 8 month delivery time with no bookings being accepted. I took a test drive and i was impressed with the detail design from Mahindra Industrial Designers. I know some of the designers as I am also Industrial designer & they are from my same school - IDC, IIT Mumbai. 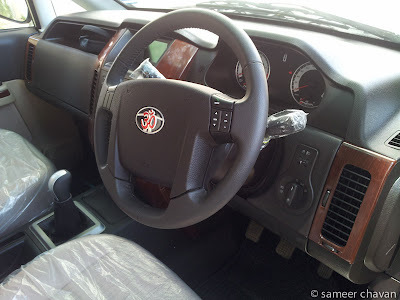 Mahindra designers have given a very detail thought for every thing from door handles, car keys, led lights in headlamp, stopping car on idle, voice activated commands, touch screen navigation, etc... Its a well job by their product managers and engineers and the whole team. Tatas don't even stand close to Mahindra in XUV500 Vs Aria. The steering of XUV500 is awesome smooth. Mahindra designers have really design for night interiors. They have given a thought on how the interiors would lit up in night. What are the lights that will glow. Really no one designs that in Desi companies. But Mahindra proved it they can. XUV looks really like SUV. Where as Aria is neither SUV nor MPV. So they call it crossover. Indians are confused on this concept. On my test drive i could feel the jerk for 2nd gear engagement. The clutch engagement is not smooth like Aria. The gear box and engine are not that polished like Tatas. They make vibrations and noise. Also the suspension has too much rollover and bounces. I purposefully took the XUV on a bumpy road and all my body was shaken. Very bad suspension design, which is fact of all mahindra vehicles. The position of gear is so close to the seat and your legs that it almost touches. I found that the front seats are too close than Aria. You almost feel like touching the shoulders of pillion. There is no booth space. No luggage space. The last row seats almost touch the rear door. Our Desi Khatara companies really lack finish and quality. Indian Cars offer lower engine warranty than Japanese cars. 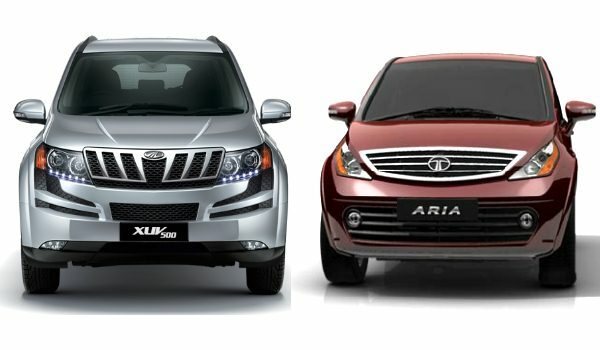 Since XUV500 was not available for booking and Aria could be delivered in a week, i went ahead with Tatas. I had taken few test rides of Aria. I found the suspension and engine very good. The interior space is also good. And since i had used India for 5yrs, i thought Tatas wont do such a bad job after 10yrs later. My first day of Aria was horrible. At the night, the high beam lamp was not working. Next day i went to the showroom and they said the car was delivered with no lamps in not working condition. I got a replacement and wrote email to Tata sales and KHT Motor GM. Next day i started to hear loud AC fan noise. I couldn't believe this. It was like your window AC starting and shutting. The car use to shake and i could hear loud rattling noise. I thought I was using petrol Ford Fiesta and Diesel Desi Khatara cars would make noise. But i never had that noise in my Indica. I took this to showroom and they said the fan bolts are loose and its making noise. They did tight the bolts which reduced some noise. But the noise is till there. They told me that is because only one Fan is being used for AC and Engine cooling. This is a bad design. Seating Posture - Aria has put steering too far from seat and towards right door. Because of this you tend to lean forward like truck driver to rotate wheel. The driver door armrest is far and does not support your Right hand elbow. I added an extra cushion for support. The steering wheel cannot be pulled towards you. It can only be raised up and down. Steering wheel - This is very badly designed. The outer wheel rim reseeds back and the centre horn bulges out. Because of this its difficult to hold grip of the wheel. The audio control buttons are too close to the outer rim and you accidentally press them while rotating wheel. Hard power steering - I would say, Aria does not have a power steering. Its so hard that it takes 2 people to rotate it. When i complained to TATA engineers, they say all TATA trucks and cars have same design. So they have assumed that Truck experience should prevail to Aria. But i know my India was very smooth. Instrument Cluster - Digital tachometer - Tatas have added such a small digital tachometer to show KM and Full range, its smaller then cheap Micromax mobile screen. The same 2 line display is used to alternate information using a steering wheel lever. Its like old Nokia phone that only had one centre button to send sms, accept calls, dial call, and do 100 functions. I don't know whey TATAS are saving money by giving such a small display. my ford fiesta has 5 line digital display. Now the electronic problems... this display keeps flicking and you really don't know what it is showing. Centre Digital display for Radio and Reverse sensor - This is the most outdated stuff in Aria. Its plan blue color with empty space and some DOS prompt kind of text. Even the cheap touch screen android tables are available at Rs5000. Why has TATA used this button operated display against touch screen XUV500 use touch screen and the UI is best with color graphic. TATA display is like 1920s display. This is real SHAME to tata attitude. The Pleasure variant(my car) only has FM and rear sensor. There is no rear view camera. The camera cost only Rs2000. But tata has shown its attitude. XUV500 gives that as default. 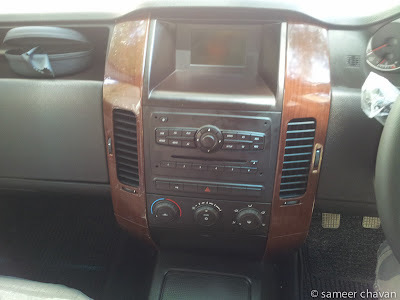 Wrong AC Vents near your knee, Centre digital display is old style, Boxy look. The center console cannot be changed. 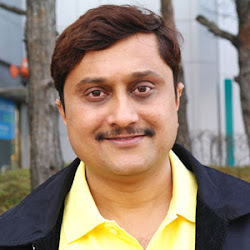 I wanted to buy Mapmyindia 30,000 unite and put there. But TATA is made sure you cannot do anything. AC Vents - The air-condition vents on front dashboard are totally wrongly placed. The whole world has it on the top edge while Tata thought they are doing genius invention to avoid headache and put that inline with your body. Now the AC air blows between your legs and your thighs are frozen. When you hold your wheel, the AC blow is direct on your fingers and your had is numb. The louvers control is also bad. You cannot deflect the air blow totally up. The knob moves only half way..
AC Noise - As mentioned earlier the AC makes a big rattling noise when it switched on and off. This is due to the single fan design for AC and Engine cooling. The noise is very noticeable and it's like your window AC. Totally unexpected from TATA. Indica has 10times smooth AC then Aria. Hinges for lighter and cup holder- This is the cheapest design of plastic hinges. On day one the cup holder cover hinge was broken. Its so delicate that couple of use will break it. The cover for cigarette lighter does not work. Advice to other to not to open it often. Clutch problem - The clutch is imported from Truck. Its hard like driving a Truck. After driving just 200km i have muscle cramps and I had to take pain killers. Clutch position offset - When you are driving you will notice that clutch is not at the centre of steering & seat. Its somewhere on the left side. Because of this your brake and clutch are too close. If you wear big shoes they will touch when you press brake and clutch together. Another engineering flaw.